Today’s Throwback Thursday takes us back again to our first new car: a FOX Mustang. 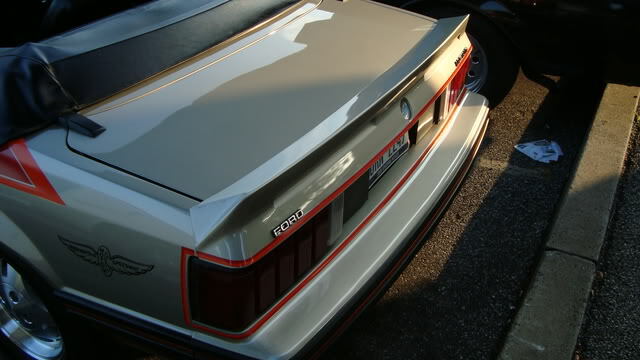 The term “FOX” refers to the platform underpinning the 1979-1993 Mustang, as well as the Fairmont, Thunderbird, LTD II, and other cars from those years. The FOX platform had one of the longest lifespans in the history of Ford – some say too long. And with very minor modifications it became the SN-95 and soldiered on thru 2004. That’s a long time… but clearly this car had a very large impact on legions of Mustang enthusiasts everywhere. 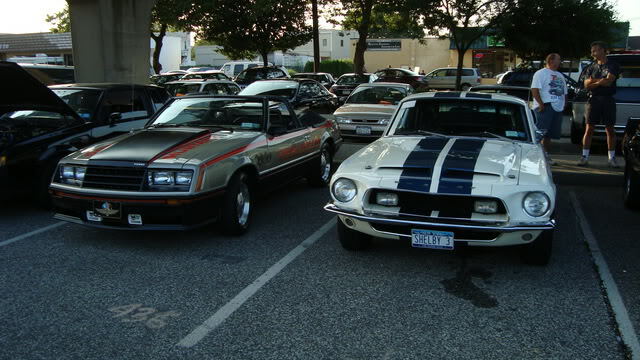 Our own hobby goes back to a ’79 Cobra Mustang, ’79 Pace Car, ’83 and ’86 Mustang GTs, and of course our Mustang SVO. We’re original owners of all of these, and of course they were all driven in events at Watkins Glen, Nelson Ledges, and more. Ford’s Mustangs of these years not only kept the Mustang hobby going (after the dry spell of the Mustang II years), they were the foundation for the performance revolution that Ford started with its first “SVO” parts catalog in the mid-eighties. Make no mistake about the significance of the Mustang in those years: the Mustang is solely responsible for starting the performance movement of the eighties; GM and Chrysler were caught severely lacking. Nowadays there is an entire new generation of people buying and restoring early Fox Mustangs – and many of them weren’t even born when these cars came out. The go-to-place on the internet is the Four Eyed Pride site. The site provides all kinds of interesting news, links to vendors, forum postings, and examples of well-restored cars on the site. As well as many modified cars (and it is all but impossible to find an original car for a restoration). 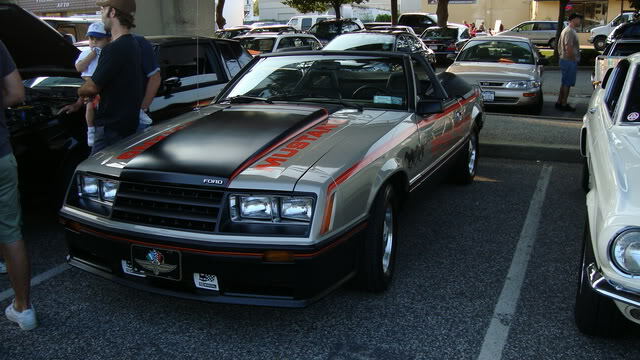 One such example of a modified car is this 1979 Mustang Indy Pace Car convertible. As you may know, Ford was chosen to provide the pace car for the 1979 running for the Indy 500. Ford built 2 cars, with highly modified 302 V-8 engines (since the standard 302 didn’t provide the necessary performance to lead the race). Ford also built 8000 replicas and sold them thru Ford dealers. Unfortunately, they sold very poorly… many examples were still sitting on the dealer lots for 2 years or more. 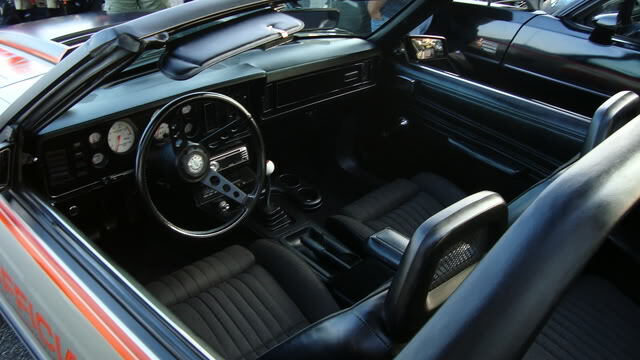 But a convertible was never built… Ford didn’t even make a convertible Mustang until the 1982 model year. So this leaves it up to the hobbyist to fill this gap. This particular example was probably built from a 1985 or 1986 Mustang. It’s missing the Recaro seats that were used in the Pace Cars, although it does have the correct steering wheel (Pace Cars used two different wheels, with and without cruise, the one shown was no longer available by ’85 or ’86). This is a very good replica, right down to the entire front end (but incorrect proper license plate bracket). The roll hoop is of course not original (and we don’t like them, they are not structural and in any kind of roll will end up wrapped around the necks of the occupants of the car). The interior is where its actual origins may be revealed. It has the correct dash (but incorrect gauge faces) and Pace Car badge, the correct console (except for chrome around the edges), but the wrong seats. The seats appear to be the ’87/93 style, but with 85/86 mesh headrests (to emulate the missing Recaros). The door panels are also incorrect. 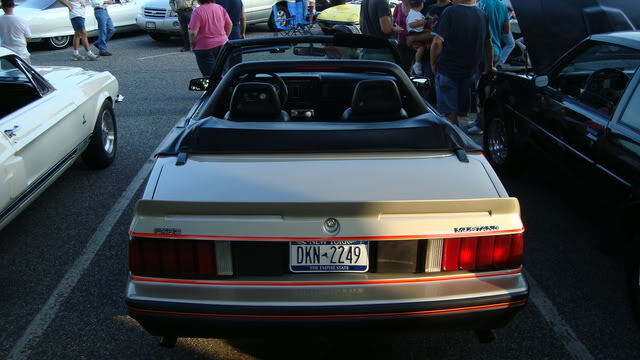 The Pace Cars were all built on hatchback bodies, so this is where the later model convertible donor would have had to come into play in this conversion. Very handsome – both of them. The rear spoiler is entirely non-standard… note that the end caps were bonded together and the resulting part was simply bolted to the trunk lid. It doesn’t exactly fit right… Ford never offered the part this way. But again, note the chrome lettering on the spoiler, this is period-correct. Good job! As for our own Pace Car, there aren’t a lot of pictures of it left, but we have fond memories of it. And it was a far better car than it’s replacement (a horrible ’83 5-speed GT). With gigantic Quickor sway bars (yes, they made car suspensions then and were very good at it), Konis, the dual-snorkel air cleaner from a ’82 GT, real dual-exhaust, a few degrees of added advance, and a swapped Fairmont cop-car rear featuring a limited skip, better gears, and slightly better brakes, it was a great track car for its day and age and served us very well. We were the first owner, trading in our ’79 Cobra. We sold it to a guy who was later indicted by the Feds, so it probably went to auction and is almost certainly long gone. We’ve seen a few pace cars in good shape for sale since then but haven’t made a commitment to buy one yet. We’ve given some thought to seeking out the parts, using a ’89 LX as a base (pre-air bag, much stronger floorpan and better geometry thanks to a better crossmember, and the excellent port-injected V-8 engine and 5-speed), and having some fun, probably adding an IRS while we’re at it. Hmmm… project car time!